I’ve written extensively about the evolution of the record for the longest baseball throw; this won’t be nearly as comprehensive, at least for now, but I have some information about the record for the longest throw by a woman. 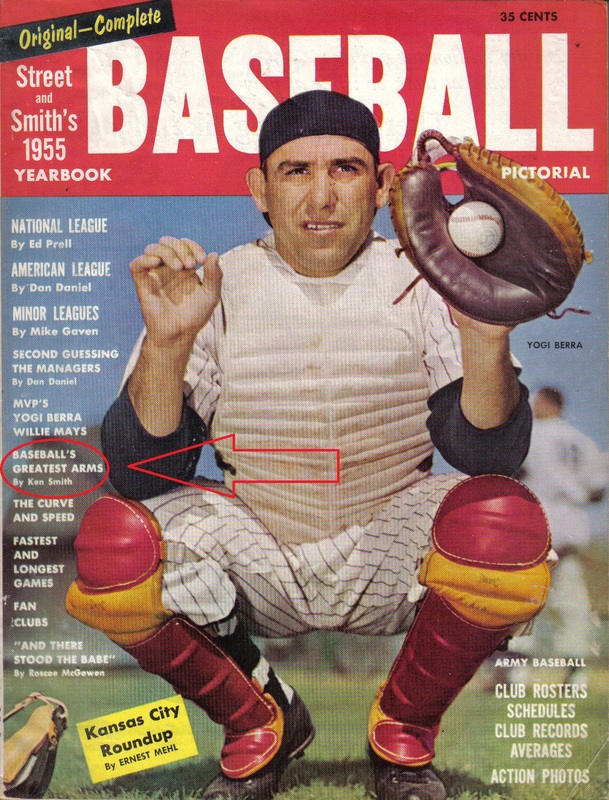 I discovered this as a separate category when I read an article by New York Daily Mirror baseball writer Ken Smith on “Baseball’s Greatest Arms” in the 1955 Street and Smith’s Baseball Yearbook. In his story, Smith wrote, “Miss Ada Paintin hurled a ball 187 feet at Iowa City, Ia., in 1910….this is regarded as the record for a female.” Well, that wasn’t actually the record when Smith wrote this — nor was it a record at the time of Paintin’s throw — but it was the starting point for my search. The Sporting Life informed us the University of Iowa football coach “T.G. Griffith” did the official measurement of the throw. (Perhaps the measurer was actually John G. Griffith, who had been Iowa’s head football and basketball coach the previous school year and was about to become the head football coach at the University of Idaho.) Neither The Sporting Life nor the Citizen offered any other details, including how many attempts Paintin made. A brief Associated Press item about her “record” achievement appeared in a number of newspapers across the country (although the Grand Forks, N.D., Herald misidentified her as a boy). The following week, on August 23, in the social notes that were prominent in smaller town newspapers of the day (and much later as well), the Citizen noted, “Miss Ada Paintin of Coralville, the champion ball thrower of the world, left for Grinnell this morning for a visit with her sister, Mrs. A. W. Hemphill, for two weeks.” I can’t tell you for how long she was primarily identified for her throwing feat. The only other information I have about her at this time is that she eventually married a man named Milo Alt and moved to Minneapolis, where she died in 1959 and was buried in Lakewood Cemetery. If I learn more I’ll share it here. The only problem was, Paintin’s throw wasn’t a record for a woman…not even close. A story in the Ottawa (Ill.) Free Trader of July 13, 1906, reported Marjorie Bell, a senior at University High School in Chicago, had broken “the world’s record in the baseball throw for women” with a heave of 204 feet 2 inches, as measured by University of Chicago football coach Amos Alonzo Stagg. (The item appeared in a number of other Midwestern newspapers that year, but this is the only one I have found via Google.) According to that story, the previous record was 195 feet, 3 inches, set by Alice H. Belding of Vassar College on May 7, 1904. An item in the 1909 Baltimore Sun Almanac said Bell’s record throw came on May 22, 1906. The gentle and womanly sport of throwing the baseball was yesterday placed on a high plane by the successful outcome of a woman’s baseball throwing contest at Dugdale’s Park….About 3,000 spectators watched the thirty contestants compete. The meet was a success. Miss Lizzie Arnold, of Bellingham, threw the baseball 209 feet 5 1/2 inches [later articles would say 5 1/8 inches], breaking all records. Miss Arnold is an athletic young woman of 16 years, and her quiet and modest ways made her victory popular with the crowd. Brief items about this achievement that appeared in other newspapers cited Bell as the previous record holder. Arnold’s throw came during the Alaska-Yukon-Pacific exhibition, and it seemed to get quite a bit more national newspaper exposure than Bell’s earlier throw had. 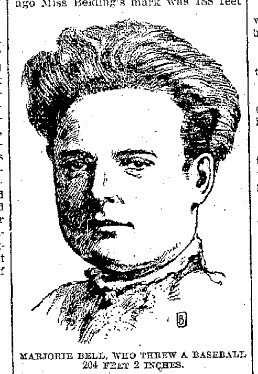 In the wake of reports of Paintin’s record claim, Arnold’s hometown paper, the Bellingham Herald, pointed out her much longer throw in the Aug. 21, 1910 edition. That item added: “Miss Arnold unofficially threw the baseball 218 feet at the fair grounds last year. The distance was carefully measured by local men but the record was not recognized abroad.” On Sept. 4 the Herald published a letter sent by Judge Henry C. Beach (“the local baseball ‘Muggsy'”) to Iowa City to dispute Paintin’s record claim. And lo, now I find a story about Ada Paintin’s record throw, published the following day (Aug. 15, 1910) in the Omaha (Nebr.) 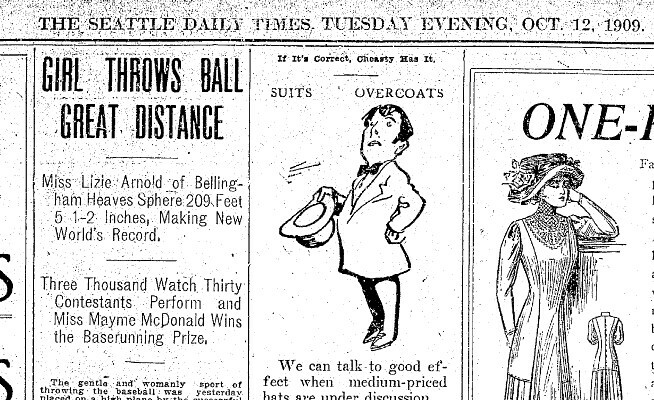 World Herald, describing Paintin’s toss as “the world’s record for girls” and citing Arnold’s 1909 throw as “the woman’s record” — even though Arnold was just one year older than Paintin (although 16 was apparently the World Herald’s cutoff for being a woman). The following was in E.R. Hughes’ “Hughes Hugh In Sports” column in the Seattle Daily Times on Aug. 9, 1915: “From Tacoma comes the claim that when Ruth McCabe, an 18-year-old school girl of that city, threw a baseball 209 feet 5 inches yesterday she established a world’s record, and that the best previous record was made by Dorothy Smith of Vassar College, May 4, 1911, when she threw a ball 204 feet.” Hughes went on to point out that McCabe’s throw actually just missed being as long as Lizzie Arnold’s. She [Gladys] is in independent girl, and when she started out she made up her mind to do something that was not an overcrowded specialty. She thinks that athletics for women is a dandy field. So I suppose she is in dead earnest about it. Palmer indeed went on to become a physical education professor and administrator at The Ohio State University. In 1929 she wrote a book, “Baseball For Girls and Women,” and she organized the first college women’s golf championship in 1941. The Women’s Golf Coaches Association gives the Gladys Palmer Memorial Service Award in her honor, and in 1997 she was inducted into the Women’s Varsity “O” Hall of Fame at Ohio State. Palmer’s record may not have lasted long. 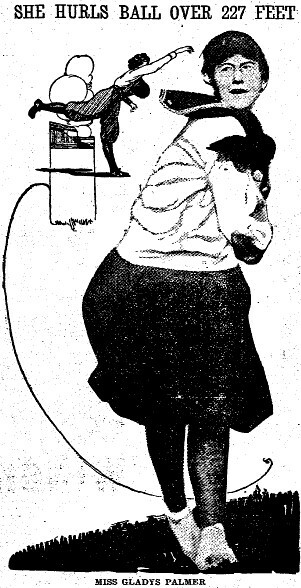 On June 18, 1916, a story by Harold Johnson in the Milwaukee Journal claimed, “Miss Elizabeth Faville of Lake Mills, Wis., in a girls contest at Milwaukee-Downer College, an exclusive school for women, broke Miss Palmer’s record by a foot, throwing 228 feet. She is said to have scored 240 feet in practice.” No date was given for Faville’s throw. That same story and photograph appeared in a number of other newspapers at that time, but I have found no future references to Faville as the record holder. Strangely enough, in May 1918 a United Press story made the rounds claiming Gladys Palmer had set a world record by throwing a baseball 215 feet 11 inches in a meet at Madison May 22. That was shorter than her throw of May 1916. 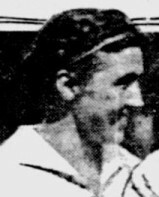 In late 1925 and early 1926 a very brief piece of filler appeared in several newspapers listing Palmer as the women’s record holder with a throw of 226 feet, a distance that did not appear in stories about her 1916 toss. Alas I don’t yet know any more about how the longest throw mark evolved from 1916 to 1930, but I can take you to the record that is still recognized today, set by one of the greatest athletes of all time, Mildred “Babe” Didrikson. 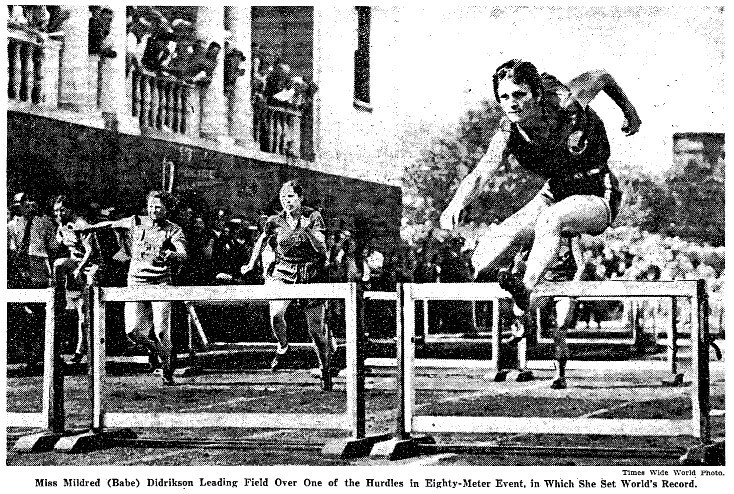 The day before her 20th birthday, Didrickson won three events at the ninth annual AAU women’s track and field championship July 25, 1931 in Jersey City, N.J. She set a women’s world record in the 80-meter high hurdles (she ran her record time in both her qualifying heat and in the final), won the running broad jump (an event we now know as the long jump), and, according to New York Times reporter Arthur Daley in his report the next morning, “shattered the American mark for the baseball throw.” She was the defending champion in the javelin throw but apparently did not compete in that event in 1931. The baseball throw was part of the AAU championship competition from 1923 until 1957. (A basketball throw competition was also part of some meets.) Daley reported Didrikson “tossed a regulation National League baseball 296 feet, a good bit beyond her own American mark of 268 feet 10 inches that she had established at the last championship meet at Dallas.” The throw by runner-up Mabel Cutchin came up more than 44 feet short. I don’t know whether Daley’s reference to an “American record” for the baseball throw implied the world record was longer, but I’ve found no reference to a longer throw by a woman at any time anywhere; perhaps the U.S. was the only country where the event took place. Didrikson was named the Associated Press’ Woman Athlete of the Year in 1932 and went on to win the honor five more times, the last of which coming 22 years later. Read that sentence again so it sinks in…she was the nation’s top female athlete at age 20 and again at 42. And she was chosen for her excellence in two different sports: her first honor came for track and field, the other five came for golf. UPDATE 8/11/13: The Sports Illustrated stories served as the basis for William Oscar Johnson and Nancy P. Williamson’s book “Whatta-Gal: The Babe Didrikson Story.” The book has other mistakes about Babe’s baseball career, which I point out in this post. I’ll keep adding to this as I find more information. This entry was posted in Baseball on July 21, 2013 by prestonjg. When I was 12 yrs old I threw a baseball in an AAU National Meet 265’10”. 1967? Females weren’t able to throw javelins back then until we were 14 yrs old. Babe Didrickson was an outstanding athlete and a legend!